Will Egypt's elections second round be blighted by more violations? 19:45 Female judge Tahani El-Shafee, commissioned to supervise polling at the Ahmed Zewail School in Giza's 6 October City, accused independent candidate Hisham Salam of assaulting one of the committee’s female employees. El-Shafee reported the incident to police, alleging Salam slapped the employee following a verbal exchange in which he accused her of coaxing constituents into voting for the Muslim Brotherhood affiliated FJP. 19:40 Electoral commission chief Abdel-Moez Ibrahim announces that polling will be extended two hours until 9pm due to high voter turnout. Several polling stations across Giza and other governorates included in round two witnessed delays of two hours or more, as some stations opened late due to judge tardiness (see our 11:21 post) and others witnessed acts of violence, voter protest and illegal sloganeering and campaigning. In three governorates -- Beheira, Sohag and Menoufiya -- electoral list elections were postponed for a week due to a court decision (see our 11:32 post). Ibrahim earlier stated in a mid-afternoon press conference that today -- the first day in Egypt's second round of parliamentarty polling -- is "a step towards democracy." Thursday will conclude the inital phase of this round. 19:17 Judge Yousri Abdel-Karim, a senior member of the SEC, refuted reports, circulated by various media outlets today, that ballot boxes were discarded due to irregularities and that polling stations were forced to shut. Abdel-Karim added that the second round of parliamentary polling has transpired without obviously difficulty in all nine participating governorates. 18:59 Around 1000 voters stormed the Religious Institute’s polling station in the district of San ‎Al-Hagar in the Sharqiya Governorate, objecting to delays in the elections process. Police and military forces ejected them from the station. Voting eventually resumed. 18:54 Judge Ahmed Qenawi says Mohamed Magdy Khalifa, head of Giza’s preliminary court responsible for supervising Giza’s polling stations, denied that six polling stations at Shagaret ‎El-Dor School had been shut down. He also refuted complaints that supervising judges at the six committees were biased toward the Muslim Brotherhood’s FJP. Other anonymous sources told Ahram’s Arabic Gate that representatives of the FJP did penetrate the six polling stations, stole ballot papers and filled them for their favour, which prompted the respective judges to close the six committees for a time. The judges also called on police and military forces to deal with the assailants before voting resumes. 18:30 Ballot counts in Tunisia indicate that 60 per cent of eligible voters participated in second round polling. Ahmed Ismail, the Egyptian ambassador to Tunisia, stated that the foreign ministry has been informed of the results, which will be sent to the SEC to redistribute among the various constituencies. 17:17 The SEC decided to shut six polling stations at Shagaret ‎El-Dor School in Giza after complaints that supervising judges were biased toward the Muslim Brotherhood’s FJP. The judges denied the charges, but the SEC decided to close the stations upon the recommendation of security personnel. 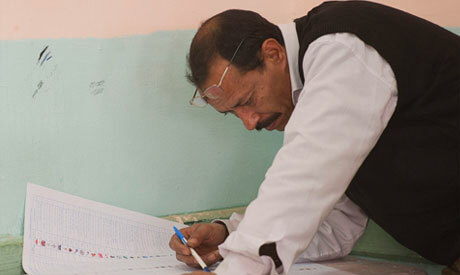 Talimah also reported violations at a polling station ‎in the Bargil area of Giza’s fifth district. The parliamentary candidate informed military police and police personnel of these violations, after which the polling station was shut. 15:44 Sheikh Hafez Salama, a popular resistance figure from the British colonial era in Suez, praised the elections process, stating these polls are the first legitimate ones in decades. In statement released earlier today, he stated that residents of the canal province were queuing in long lines, eagerly hoping to have their voice heard. The 86 year-old Salafist sheikh believes that Egyptians need not worry of an Islamist takeover of parliament, as every political alternative has been applied. Their subsequent failures are a sign that the country is ready for a return for Islamic rule, according to Salama. In order to preserve the achievements of the 18-day uprising, the octogenarian preacher has called on the entirety of Islamist forces to unite and work as one. 15:27 In an ongoing press conference, Abdel Moez Ibrahim, head of the SEC, told reporters an earlier report (see 12:33) that Atef El-Sayed, an independent candidate in Sohag, had died from a heart attack. He blamed rumour-mongering for the false news story. 14:55 Following a court ruling Saturday that detained activist Alaa Abd El-Fattah has the right to vote, the Supreme Electoral Commission has announced that a special committee will visit him in prison. Abd El-Fattah's detention was yesterday extended for a further 15 days. The prominent blogger and activist - a staunch critic of military trials for civilians - was summoned to appear before the military prosecutor at the end of October and questioned over charges that he incited violence and stole weapons from military personnel during the bloody crackdown on Coptic rights protesters in Maspero on 9 October. Twenty seven protesters died after a peaceful march to the state TV building was attacked by military personnel. 14:15 The school of Atfih in the Giza district of Cairo witnessed scuffles between the supporters of Salafist Nour Party candidate Ahmed Gebril and liberal Wafd Party candidate Abdel Wahab Khalil. The Nour supporters said the argument erupted after the secretaries at the polling booth nullified votes by intentionally placing ballot papers under, instead of in, the box. 14:10 A fight broke out among a group of women outside of Al-Tarbeya Al-Askareya (Military Training) School in Giza, preventing representatives from the Supreme Elections Commission from entering the polling station. The altercation ended after Army and police personnel intervened. 13:59 The Freedom and Justice Party's (FJP) "elections operation room" has accused Egyptian Bloc supporters of violating electoral rules and ‎campaigning outside polling stations in Ismailiya. Following the documented cases of similar activity by the FJP in the first round and today, the accusation is a bit like a swordsman in a knife fight complaining about his adversary's fork. The FJP statement also mentions that judges in some polling stations in ‎Ismailiya and Sohag prevented party representatives from ‎entering their polling stations, despite having official permits allowing them inside. ‎13:34 Another round of voting, another round of violations. The monitoring committee of the Revolution Continues Alliance (RCA) has been documenting electoral infringements committed so far today. These include the late opening of polling stations in the 6 October neighbourhood and, once again, the illegal campaigning by Freedom and Justice Party (FJP) representatives. The report centres on the largescale presence of the FJP supporters in the governorate of Beheira where they were directing people to vote for the party's candidates. The report, published by the RCA’s monitoring committee, also condemned the judge monitoring a station in Ismailiya for kicking out one of their representatives after he objected to the FJP’s tactics there. 13:12 The Reform and Development Party are again at the centre of controversy, but this time they are the ones claiming to be wronged. A representative of the party became embroiled in an argument with the judge monitoring the Nagah School polling station in Giza after he told voters to cast their ballot for the Wafd Party. 12:33 Atef El-Sayed, an independent candidate in Sohag, sadly passed away this morning from a heart attack. 12:21 An armed scuffle between supporters of two candidates in the Giza village of Defni saw security forces closing that polling station. Unfortunately, there is no information on the identities of the candidates at the centre of the heated exchange. 12:08 Some more details from the Egyptian embassies and consulates where voting took place over three days from last Friday. In Bahrain, 790 out of the 956 (82.6 per cent) Egyptians registered at the embassy in Manama voted in the second round. Ambassdor to Italy, Mohamed Farid Mounib, says that 50 per cent of registered voters took part in Rome and the consulate in Milan. Results from voting in Jordan have been sent to Cairo, according to Ambassador Amr Abu El-Atta. 11:52 A major concern among Egyptians is the perceived lack of security in the country since the Ministry of Interior had its tail burnt by the uprising. The failure of the military junta (SCAF) to solve the issue has seen their credibility as guardians of the transitional period seriously compromised. Al-Hayat TV channel reports that an armed gang this morning attacked the home of Rashad El-Bayoumi, deputy to the supreme guide of the Muslim Brotherhood. 11:40 Security forces have arrested five supporters of the liberal Reform and Development Party candidate Mostafa Awad in the governorate of Menoufiya. Awad's supporters were detained after being accused of trying to enter the Ezbet Almal polling station to mess with the votes in their man's interest. There is a strong military presence at polling stations across Menoufiya, where, as we reported below, electoral list voting has been put back a week in the governorate's first constituency. The troubled governorate has long had to bear the indignity of being known primarily as the birth place of ousted dictator Hosni Mubarak. 11:32 The biggest disruption of the day so far comes with the news that parliamentary elections for the electoral lists in the governorates of Beheira, Sohag and Menoufiya have been postponed for a week to 21 and 22 December. The move comes after an administrative court ruling that some parties were not included on the ballot paper in the second constituencies of Beheira and Sohag and Menoufiya’s first constituency. 11:21 According to the Ministry of Interior, 39 polling stations in six governorates are yet to open for voting. The main cause for delay seems to be the absence of judges assigned to monitor the stations. In Giza alone, 18 polling stations remain closed to voters. Meanwhile seven are likewise shut in the Delta governorate of Beheira and Sohag in Upper Egypt. Voters in Sharqiya, Beni Suef and Aswan have also been left outside. The president of the National Council for Human Rights, Hazem Mounir, reports that 35 complaints have already been filed concerning today's voting. The failure of some polling stations to open on time is the main source of grievance. 10:46 Boutros Boutros Ghali, former UN secretary-general and head of Egypt's High Council for Human Rights, has voted near his home in Giza's Secondary School. After taking a tour of polling stations in Giza, Boutros Ghali hailed the lines of voters he came across as "Lines of democracy." 10:36 Counting has finished for Egyptian expat votes in Saudi Arabia. The Egyptian embassy in the capital Riyadh and consulate in the coastal city of Jeddah have sent the results of second round voting to the Foreign Ministry and the Supreme Electoral Commission (SEC). According to preliminary figures, the number of voters who took part is down around 20 per cent from those in the first round when 35,000 took part. With 3 million Egyptians, Saudi Arabia is home to the largest expatriate community. Safe to say the Egyptian Bloc is not pinning its hopes on sweeping the Kingdom. 10:17 It's busy in Giza where former prime minister Essam Sharaf has been spotted waiting in line to cast his vote. Sharaf and his cabinet resigned before the first round in response to the mass protests and uprisings across Egypt at the ruling military council's handling of the interim phase, including the impression that the Army intends to maintain a stake in the country's political future rather than return, as promised, to their barracks when a new government and president is elected. During six days of protests, more than 40 protesters were killed and hundreds injured by Egyptian security forces. Many of those injuries were caused by tear gas imported from the US. Al-Jazeera producer Adam Makary tweets that "US Ambassador Anne Patterson is visiting polling stations in Giza." 10:04 Across the Nile from Cairo in the governorate of Giza, voters are out in numbers. In the neighbourhood of Boulaq El-Dakroor, meanwhile, polling stations are late to open as queues stretch for more than 50 metres. 09:48 In the port city of Suez, security forces are clamping down hard on campaigning around the polling stations. The city's head of security confirmed to reporters that he has given orders that anyone found hanging banners in front of stations is to be arrested for contravening electoral laws. Persistent campaigning as voters queued to vote was the most cited violation by candidates and their parties in the first round. While not as serious as the blatant practices of vote-rigging and intimidatory violence employed by the NDP in previous elections, the sight of campaigners pushing their candidates until the very step without any shame did put a bitter taste on the two days. 09:00 Polls have been open since 8am in the nine governorates, covering the length and breadth of habitable Egypt, electing their parliamentary representatives in this the second round of elections. Votes have today and tomorrow to vote, and in those constituencies where no candidate secures at least 50 per cent of the vote, run-offs will be held on 21 and 22 December. One hundred and eighty seats are being contested by 3,387 candidates in Giza, Beni Sueif, Sohag, Aswan, Menoufiya, Sharqiya, Beheira, Ismailia and Suez. Of those seats, 60 will be filled by independent candidates with the remaining 120 being aportioned among the party lists. According to official figures, 18.7 million Egyptians will be eligible to vote in this stage with 355,000 Egyptians - most residing in the Gulf - living abroad registered to vote in the second round. How they vote could be more in tune with the past than in the previous round. Writing in Ahram Online yesterday, Gamal Essam El-Din predicts that the main faction to rival the Brotherhood's Freedom and Justice Party and the Salafist Nour Party will come from members of the dissolved NDP. "Overall, NDP remnants are expected to constitute the primary counterweight to Islamist parties in the second round. In the Sharqiya Governorate, for example, Ali El-Moselhi, former NDP minister of social solidarity, is running against two Islamist rivals in the district of Abu Kebeir. NDP offshoot parties, meanwhile, such as the Egyptian Citizen Party, the Conservative Party and the Horreya Party, will together field some 200 candidates. A number of other NDP veterans will contest the elections as independents." The success of the Islamists in the first round was the main talking point in Egypt and beyond, striking optimism and fear in the hearts of their supporters and opponents. The Nour Party alone took 20 per cent of the vote and 33 seats. To put this in perspective, the number of seats won in total by the main liberal alliances of the Egyptian Bloc and Revolution Continues plus the Wafd Party was 35. The Egyptian Bloc's performance in this round is likely to be further undermined by their decision, on financial grounds, to compete for just 30 per cent of the independent candidate seats. Another notable contestant in this round is Al-Jamaa Al-Islamiya whose Reconstruction and Development Party is fielding 16 candidates in the second stage, 13 of whom will contest independent seats. The party made a ripple by winning two seats in the first round. Al-Jamaa Al-Islamiya are believed to be behind the 1981 assassination of late president Anwat Sadat, making their participation alone in these elections a remarkable comment on the opening up of politicial space in Egypt since the ouster of Hosni Mubarak. While everyone talking how bad Mubarak, wait to see what Islamist will do. There already religious cleansing. There is reason why he held them under the control. Not some imaginary threat that everyone claimed to be. So hura Iranian style democracy.